Aggie has been completely enamored with the sport ever since—or ever before, based on the stories she had heard before getting involved with canoeing herself. At Camp Aloha, an all-girls camp for campers aged twelve through seventeen, they use wooden canvas canoes that are over 100 years old. The foundation has the highest number of canoes in all of North America. At the camp, there are ranks to recognize leadership, and the past summer, Aggie earned the highest rank, the Admiral. There are many aspects involved in earning ranks, from interdepartmental projects like hiking and swimming and tripping to independent projects. In this trip, Macy learned the responsibility and rush of excitement that comes with plotting, planning, and executing a trip in the wilderness. She loved leading the trip, and soon she would find a way to bring the skills and passion she learned to other aspects of her life. Outside of camp, she began to plan an adventure in father-daughter canoe trips to places in Vermont and Maine and New York. She and her father love the stories that come with canoeing, and in telling their stories, Macy started to recognize another one of her passions converging with this one: her love of writing. “The fun thing about canoeing is retelling stories of adversity or things that have gone wrong. Things can be really scary in the moment, but looking back, it can be really fun to revisit,” says Macy; aside from oral storytelling, there are often the makings of great records, reports, and creative non-fiction. That combined force of accomplishment and anticipation has become a guiding force for Macy, and, as she began to write more and more about her canoeing adventures—with beautifully candid, fast-paced details like “The river enchanted us, we were purely reactionary, ‘rock, rock right, rock left, rock ahead!’”—her friend sent a link her way that started carving a new journey, one that combined both canoeing and writing. For those who win the Ely Outfitting Teen Essay Contest, the reward is great: a fully outfitted trip to the Boundary Waters—what Macy calls “the Holy Grail of Canoeing.” The contest is open to all skill levels and results in the chance for teens to — totally independently— navigate the Boundary Waters with their friends. No adults attend, so it is perfect for motivated, independent paddlers who want to put their skills to practice. “The outfitting company that’s offering it acknowledges that this is the first year, so this is everybody’s first go-around,” she adds. Macy is glad that the contest is open to teens of all skill levels; she is excited that others may get the chance to find the patience, confidence, courage, and reflection that canoeing teaches. What has she enjoyed learning the most? The building project began as “just a spur of the moment thing,” she says. 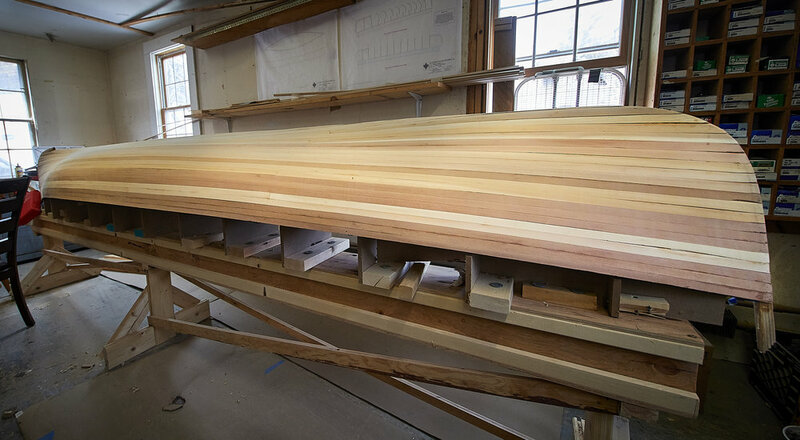 “My mom said, ‘wouldn’t it be so neat if you built a canoe?’ I started researching and found this place in Bristol, New Hampshire that sells kits, and all of the sudden I was going and picking up lumber,” she smiles.